The Museum of CT Glass has a number of items for sale, available during Museum hours. For more information, please contact Susan Barlow at sbarlow627@aol.com. Click each image at right to bring up a larger view. 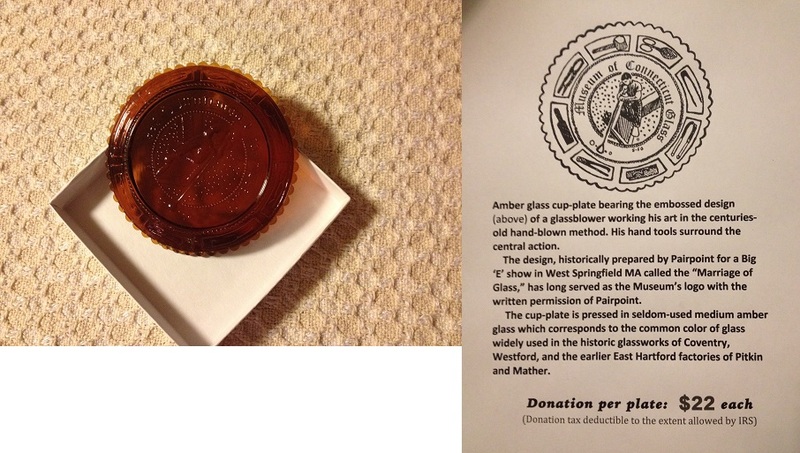 • The Museum has 100 commemorative glass cup-plates, bearing an embossed design of a glass-blower, for a $22 donation. The right part of the image gives more information on the design. • The Museum always has on hand a good number of bottles available for inspection and purchase, for a $3 donation each. The bottles vary from opening to opening, and aren't organized -- just on a table. Those in the left image are a miscellaneous sampling, while those on the right include a selection from various Manchester pharmacies.